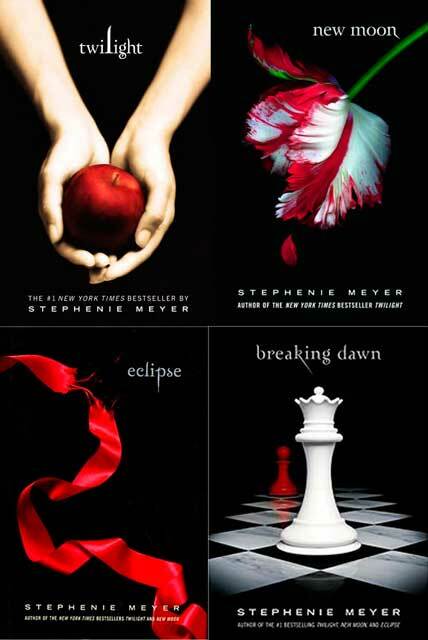 Chick with Books: The Twilight Saga in Review... Is it Happily Ever After for Twilight Fans?? The Twilight Saga in Review... Is it Happily Ever After for Twilight Fans?? New Moon continues the complications of a romance with a vampire, the love story of Edward and Bella, but this story is Bella's pain. Edward realizing how dangerous he and his family are to Bella's safety (fresh blood and vampires are a dangerous combination and Bella is a bit of a clutz) decides to leave Forks. If you really love someone, can you simply walk away if you think it's the best thing for them? Bella spirals into a depression that turns dangerous as she turns daredevil to try and feel anything. Her friendship with Jacob turns into a little more than friendship, as he becomes her crutch and then her sun as she tries to live through each day without Edward. But as Bella tries cliff diving, Alice, Edward's "future seeing" vampire sister, tells Edward she's seen Bella die. And almost like Romeo and Juliet, this bit of information has dire consequences. We have an exciting and frightening "meet & greet" with the Volturi, the most powerful vampires "alive", who make sure all the "rules" are kept among their kind, as Edward begs to be released from his earthly ties, and then finally must deal with them as he & Bella find each other once more. But you can't write anymore books without Edward, right?! We learn about Werewolves, and love triangles, and what getting grounded is all about. Eclipse is revenge, truces and still love triangles with the faint sound of wedding bells as background music... In Book One of the Twilight Series, Twilight, we meet the devastatingly beautiful and dangerous vampire Victoria. As her mate, James, decides to have Bella for a snack, a dangerous cat & mouse game ensues with enraging results for Victoria. She wants revenge for what happened and Eclipse is where she makes her stand. As a vast army of newborn vampires are created and begin to wreak havoc in Seattle, the real goal only becomes clear as time goes on... And the action heats up, an alliance is made , and we are left on the edge of our seats as we wait to see who lives and who dies in a blood thirsty battle with vampires. Breaking Dawn is all about resolutions, true love, and happily ever after. Wedding Bells ring early in the book, as Bella weds her true love. But things are never easy in Forks for some reason, and something happens that threatens all that Bella loves, and her frail human life. But at the last turn of the page of Breaking Dawn you know the answer to "will she or won't she", who Bella will spent eternity with, and can vampires and werewolves really get along... And as much as I wanted to savor the last book of the Twilight Saga, I just couldn't put this down. I don't want to give away too much here because if you don't know what happens in Breaking Dawn, it would be a BIG spoiler, but suffice it to say that you will be furiously turning those pages until page 740 to find out for yourself. Things to look forward to? Two more Twilight movies, which will cover the last book, Breaking Dawn. I recently saw the movie Eclipse and loved it! Especially the vampire/werewolf fight, which was done so well... I still have The Short Second Life of Bree Tanner to read... But what I'd really like is for Stephanie Meyer to finish Midnight Sun! Midnight Sun is Twilight told from Edwards perspective. Unfortunately someone posted the unfinished partially written draft of Midnight Sun on the internet without Stephanie's permission, and the author was so upset she decided not to go forward with the project. But one can hope that someday Stephanie will go back to Midnight Sun, and we'll be able to read the full story of what Edward was thinking... Until then though, we can read Chapter 1 of Midnight Sun on Stephanie Meyer's website! Have you read Twilight and the other books in the series? What did you think?! Are the critics too harsh? Friendships, family, love & morality, life & death, what did you read in Twilight? And which book is your favorite? I think my favorite is Eclipse, and I think that's because I like life before Renesmee. I wish Bella and Edward had more time as a "couple" before Renesmee appeared. If you don't know who Renesmee is I can't tell you! It would ruin Breaking Dawn. *P.S. The four books of the Twilight Saga are available as a set on Kindle too! Even though I had bought the hardcovers when they came out, I found it so much easier to load them on my Kindle and read the last two books as though they were one long book. I have read all of the books and have read what is available of to read of Midnight Sun; loved, loved, loved them all! I agree, Midnight Sun needs to be finished, and I bet that it will be. It's just too good to put away on some shelf to collect dust. As for the harsh critics, can't say that I have read much of it, only a brief bit of Mr. King's thinks about the talent SM. IMO, don't let any critic dictate to you what is good or not good reading for you. If you pick up a book to read and you enjoy it, why should you care what someone else thinks of what you are reading? I finally started reading this series and I have really enjoyed it so far. I plan on starting Breaking Dawn later this week! I enjoyed the Twilight series. I listened to them on audio read by Illyana Kadushin. They rather became one long story for me. I've only seen the first movie but I thought it reflected the book well. I enjoyed Midnight Sun chapter on her website. I think I'd almost read the two books together by chapter to see it from both their eyes. Enjoy Breaking Dawn! I think my favorite book in the series is Eclipse, but Breaking Dawn really wraps it up all so nicely! And it was "hot"! Let me know what you think! Oh, I was so happy to find this! It seems like most book-bloggers are among the anti-Twilight brigade, and I get tired of it. My favorite book...I really like Twilight the best. I love the way it slowly drags you in, with all the day-to-day details that tie it solidly to the real world even while Bella is discovering that Edward is a vampire. It makes you feel like this could really happen. I agree with mainhoonemily! For awhile everyone seemed anti-Twilight and they just don't know what they're missing out on. I can't like I was skeptical at first but when I started the series I couldn't put them down. I read one after another with hardly any breaks in between. I have yet to read the movies because I know the books are always better... eventually I will get to them and hopefully they are good too.